Please click on the Portrait of the Dark Priest Shaft to see the artwork in fullsize! 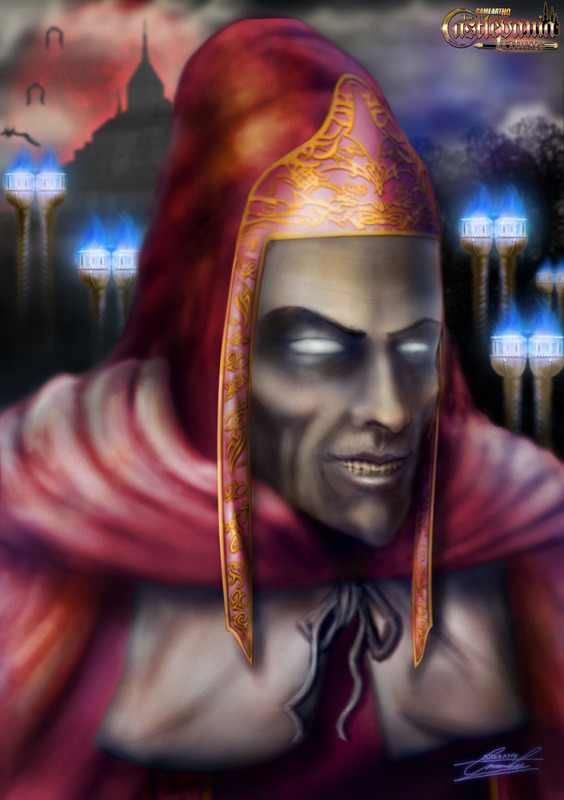 Shaft the “Dark Priest” is one of the recurring antagonists in the Castlevania games and i am pretty sure we will see him again in future Castlevania’s! This portray of him shows Shaft in his Castlevania Symphony of the Night design. In that game he brainwashed Richter Belmont and again tries to resurrects Dracula himself. He is one of the few human antagonists in the Castlevania series. Emiliano ” Sannamy” Sanna from Argentina claimed Shaft as one of the first artists who wanted to be a part of the Game Art HQ Castlevania Art Tribute and was also the first artist who submitted his entry. Emiliano found that there are almost no illustrations of the Dark Priest Shaft which was the main reason why he decided to draw him for our project. Well done Emilano, the feedback on deviantART showed you that your efforts are well appreciated by Castlevania Fans! Its always nice to see that our art projects inspire artists to draw the unpopular characters of the video game history, Shaft and this portrait of him is truly unique.